What defines Sonoran Schools is the integration of STEM content across multiple disciplines. This strategy meets the demands of the Common Core curriculum by requiring language arts teachers to incorporate more informational texts, and STEM content area teachers to incorporate reading, speaking, and writing using text-based evidence. We require students to conduct annual science research projects in collaboration with their science, math, and language arts teachers. Teachers work collaboratively to create STEM-focused thematic units to make learning engaging and relevant. In addition to an interdisciplinary curriculum, we offer many unique high school STEM courses such as Exploring Engineering Through Robotics, STEM Distinction Graduation Track, Biochemistry, Biotechnology, and AP science and math courses. Our College Guidance program encourages and assists students in securing summer and yearlong internships with local businesses and educational institutions. 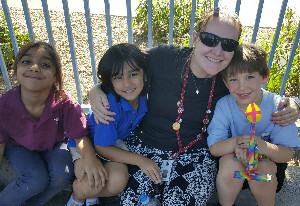 Sonoran Schools recruits teachers who are talented, passionate, experienced and highly qualified. Our teachers offer free tutoring and mentoring, and they coach academic clubs and athletics. We make home visits to get to know our students’ families better. We encourage professionals with unique industry, research and content-related experience to join our instructional team. As a college preparatory academy, we expect our students to graduate, enter college, and receive significant financial aid. College awareness and readiness are embedded in our culture and curriculum beginning in elementary school. We offer classes in middle school to help students develop skills and maturity, and offer career exploration classes in middle and high school. Students have access to the Arizona Career Information System (ACIS), SAT and ACT prep classes and mock SAT exam to assess college readiness. Our Sonoran Schools Mentorship Program (SSMP) for qualifying middle school and high school students helps prepare them for admission to top colleges. We visit in-and out-of-state colleges and host visits from college representatives to our campuses. We encourage students to participate in a variety of extracurricular clubs and programs such as Academic Decathlon and MATHCOUNTS. We use a broad range of tools and standardized test data to make decisions about student placement and programs. Our students are placed in courses based not on age but on ability level. Data guides placement of at-risk students in Title 1, Special Education, and Structured English Immersion programs to help them succeed. We identify our gifted, talented, and high achieving students and place them in our Sonoran Schools Mentorship Program (SSMP), accelerated courses, and Gifted Education programs. We encourage the involvement of our parents and local community members. We believe teacher home visits are a powerful tool in building parental involvement and we host a wide range of events such as international food nights, festivals and science events. We actively solicit local business and higher education partnerships to strengthen our academic programs and offer dual enrollment courses with local universities and community colleges. We work with business leaders to provide scholarship and internship opportunities for our students to gain real career experience. Our graduation requirements include at least 20 hours of community service by students.